I have a secret confession to make, I collect innovation frameworks, there I’ve admitted to it, and feel just that little bit better that one of my innovation secrets is out. This collection has built up over eight or so years and I have certainly seen some really excellent ones but also some seem pretty thin, those “oh dear” moments! I suppose I collect these a little like collecting pictures; some rare, some new, some promising but you can recognize and appreciate each for expressing that often difficult task of encapsulating innovation in any organizing framework. Sometimes it simply boils down to each to their own, as long as it does the job, then fine. Although I’m always curious to see how these seemingly can differ so much. Many I’m just convinced don’t go underneath the initial organizing framework top picture and I feel that is wrong. Some just seem to skate on innovation ‘thin’ ice. I’ve used one over a number of years that I feel builds innovation systematically. For some years I’ve been using one within my advisory business as a great frame to build from. It is based on three phases that you need to work through- aware, exploit and sustain and has a support base essential for this to work. The framework attempts to be a fairly comprehensive one that I would ideally want to (fully) work through if asked to build any innovation capabilities and competencies. It is an exploring framework, meaning that sitting behind it is a significant set of sub sections or component dimensions, which build towards this top level frame shown above. I’m not claiming this is ‘the’ answer or even a distillation of all the frameworks I have collected, it was developed fairly independently and just happens to work for me. Usually I use this in much of my early engaging work with clients, so as to begin to build up a comprehension through this organizing framework, so as to give some underlying substance to their emerging innovation activity. Any Innovation Journey has lots of complexity underneath it. Each of the component dimensions has considerable complexity to dip in and out to build a reasonable understanding of what does make up innovation. Let me illustrate this through one example from each of the stages- Aware, Exploit & Sustain and finally the necessary supporting or foundation part, Support. 2. An example of the component Resource Development in the Exploit Stage. Whatever framework you do select- do select carefully. My advice on selecting any organizing frameworks is to compare and contrast, to explore and get underneath. Achieving a comprehensive understanding of innovation is often badly lacking for many in their need to understand. 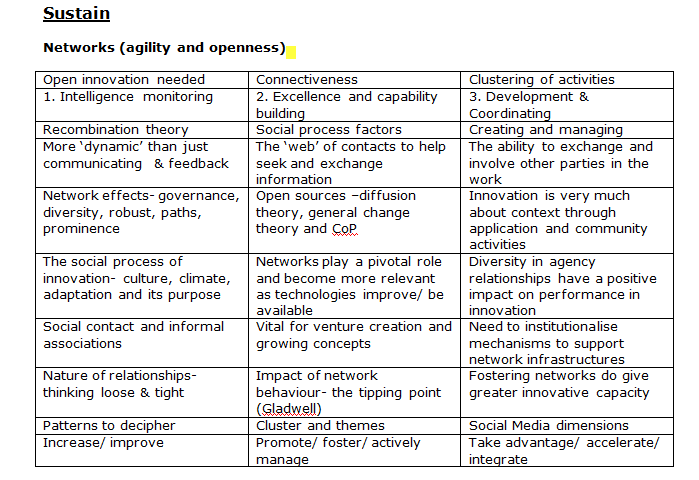 The one I’ve provided above is certainly capable to deliver a solid grasp of what is needed in building innovation capabilities and capacity. I certainly believe that and framework does have these three phases of becoming Aware, a need to Exploit and an ability to Sustain any innovation momentum and also provide the necessary Support. If you are curious to go into this further then you know where to find me. I remain always curious on how innovation is depicted so as to build my knowledge further. As always, I am ready to discuss the need for an innovation organizing framework in your particular innovating circumstances. 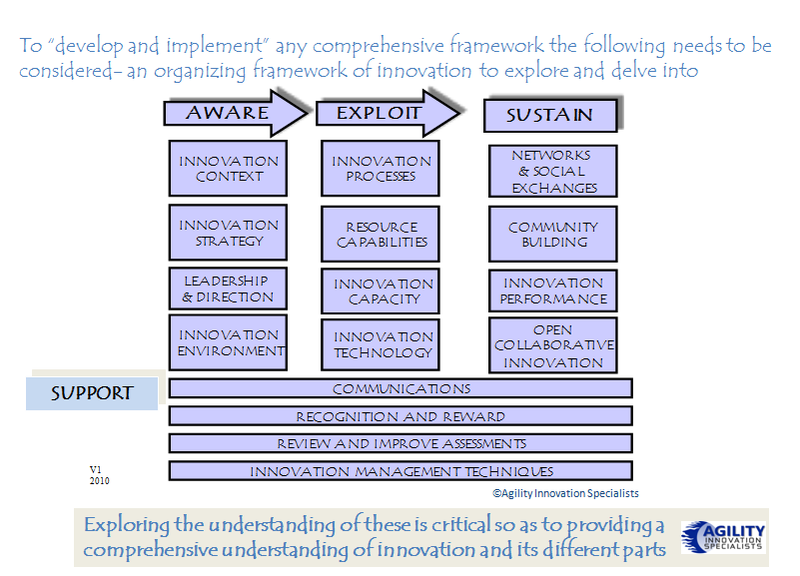 This entry was posted in Polymers and tagged Comprehensive Innovation, Innovation framework, Innovation Frameworks, organizing innovation framework. Bookmark the permalink.